Scroll down for link to video tutorial. 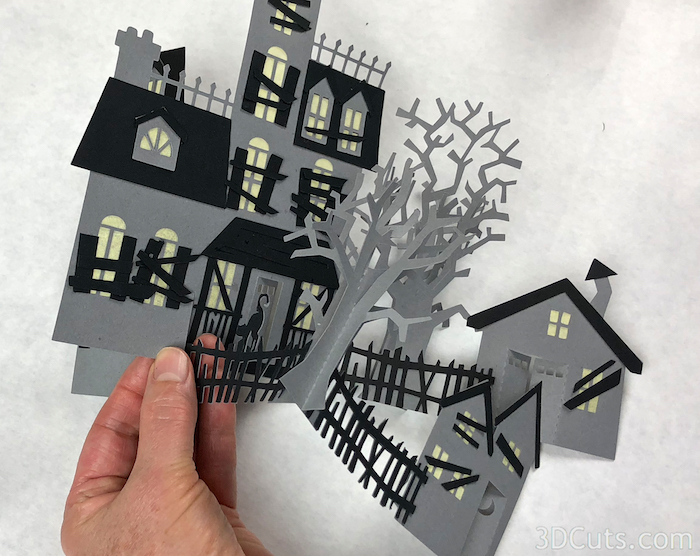 This tutorial is for the assembly of Zig Zag Village - the Haunted Version - by 3Dcuts.com. 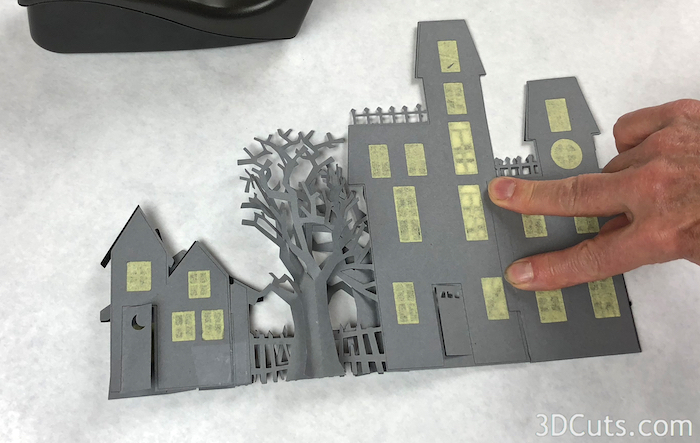 Zig Zag village is a haunted collection of buildings that can be lit with either tea lights, fairy lights or window light. My favorite was orange fairy lights. But the surprising element of this village is that it easily folds flat for either storage or mailing. It is about 11" wide x 8" tall but can be quickly folded zig zag style to fit in a standard 6" x 9" booklet envelope. It comes complete with files for cats, bats, and pumpkins for spooky Halloween decor. The assembly is easy basic 3d construction requiring mid-level organization. This version is much quicker thant the original Zig Zag Village yet not as quick as the quick version. Many but not all of the supplies I use come from Amazon. Here are affiliate links to those supplies. 8.5 x 11" card stock for buildings - I use Michael’s Recollections 65 lb Black and grey kraft available from Amazon in 50 Ct packages. Special Note: I update the instructions online. 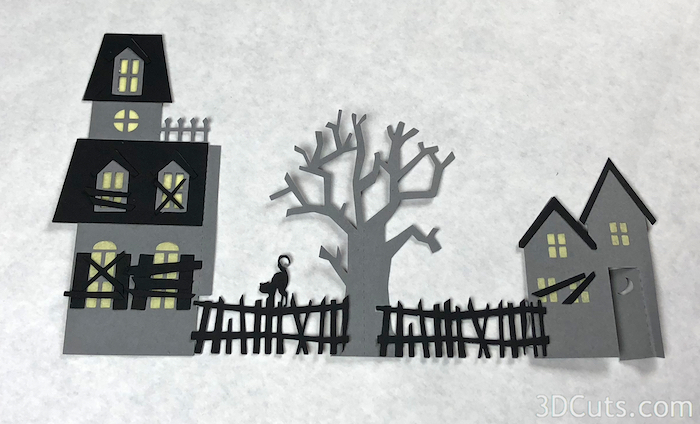 Check at http://3dcuts.com/zig-zag-village-haunted-tutorial for adjustments and additional information. Don't just rely on the pdf file that comes with the download. Learned hints and corrections are added to the the online tutorial. I'll also add photos submitted by other crafters for additional ideas. 1. 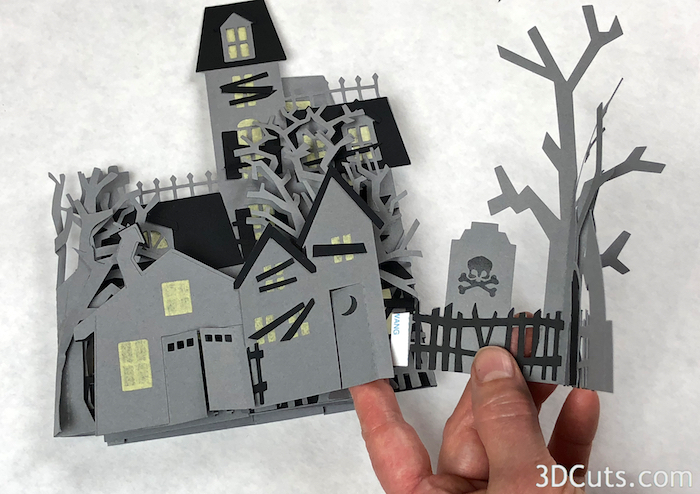 Download the cutting files for your cutting machine at http://3dcuts.com/zig-zag-village from the 3dcuts.com store. DXF files can be opened in the basic edition of Silhouette Design Studio but often require modifications. I recommend using the Designer Edition and using svg files. For Cricut Explore: Here is a guide for importing into Cricut Design Space. http://www.3dcuts.com/tutorial-adding-3dcuts-files-to-cricut. Be sure to attach parts before cutting. For Brother ScanNCut: The svg files will need to be transferred to files for your particular machine. You can change SVG files to FCM files at http://www.canvasworkspace.com/ or Google "How to import SVG files into a ScanNCut" for links to tutorials. 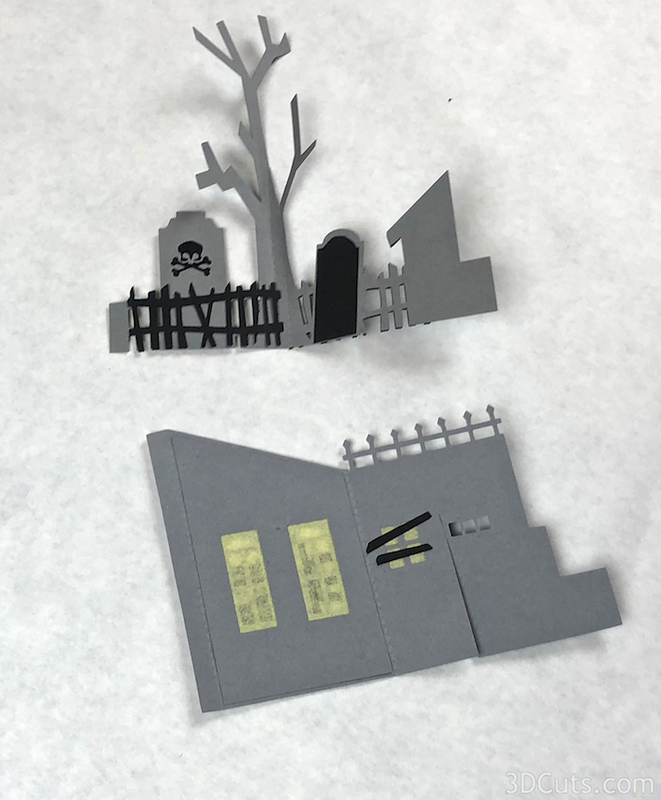 All pieces are cut from card stock. 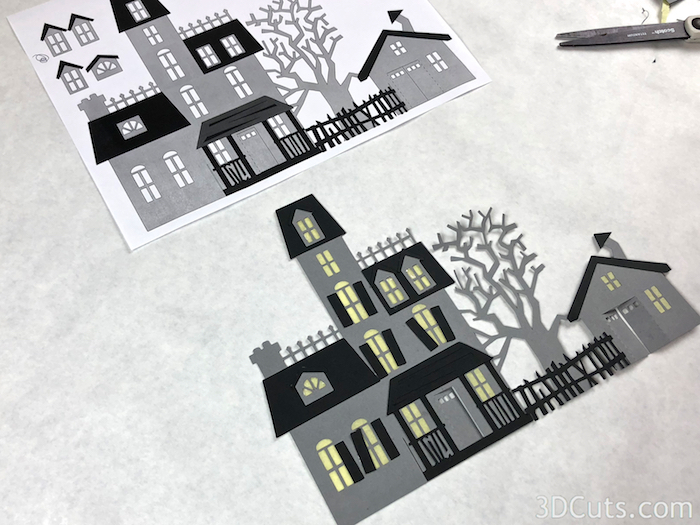 Below is a layout of the various pieces you will be cutting out. There are many pieces so keep each side (1-4) grouped together. The files will download organized into groupings that will fit on 8.5 x 11" card stock. I cut all buildings from gray card stock. That isn't a requirement. I use the cut dotted line for score lines. Fold along these. if your cutting machine can score then you can remove the dashed lines and instead add score lines. You may need to release compound paths to access the dashed lines. Use a good blade. I have found the Silhouette Premium blade to be well worth the money for those of you using Silhouette. A mat in good condition is also important. I use the Nicapa mats from Amazon - Nicapa Cutting Mat (Affiliate Link). If your mat and blade are good then all the little windows will cut well and come out easily. Follow this diagram for placement of the black details on Side 1. Lumber gets placed randomly over windows. Follow this diagram for placement of the black details on Side 2. Bats and lumber get placed randomly. Follow this diagram for placement of the black details on Side 3 and 4. Notice things get placed on BOTH sides of side 3. Do you prefer to work from photographs? If so, here is a quick photo tutorial of the assembly process. There is more detail in the video. 1. Cut all the files according to the instructions above. 2. Add tissue paper to all windows in all of the building liners. Each building has a liner with holes cut for the windows. Put a thin line of glue around each window opening, cover all with a piece of tissue paper (vellum or waxed paper could be used), then use an xacto blade to cut around the window. Do not cover the door openings. Peel away the extra. Do this to sides 1, 2 and 3. The liners will be adhered to the back side of each building. The tissue paper should be between the two so the edges don't show. Match the images to be sure you add the tissue paper to the correct side. Adhere the pieces with added tissue paper to the back of sides 1 and 2 but split them as described below on side 3. Adhere to back of side 2. On Side 3 be careful. Match the photo above. The wall is bent and one tissue paper covered back piece goes on each side. Sides 1,2 and 3 all have openings to apply tissue paper to. There are none on side 4. Referred to the diagrams above for the placement of all the black details. Start with the roofs and porch. Shudders get added at angles. Lumber is placed randomly over windows to board them up - leaving space for light to shine through. Side 1 before adding boards to windows. Side 2 with random lumber added. Side 3 and 4- one side. Be careful here because things get added to both sides. Side 3 and 4 - the other side. Add the extra tree layers. Fold and adhere using Scor-Tape. One gets added to the back of the tree on side 1. One gets added to the side as shown on side 3. Same side as RIP facing forward. Here you can see the direction of each fold. Side 1 is in the middle back and folded forward. Side 2 is in the front and folded backward. Side 3 is on the left. Side 4 is on the right. 4. Connect the village parts together. Sides 1 and 2 each fold, side one on the edge of the mansion and side 2 on the dotted line mid tree, and slide together lining up the notches. You want the bottom edges to line up. Add a piece of scotch tape to hold the short seam as shown. This is between the back of the fence on side 1 and the shed on side 4, below the window. Add score tape to the long tab on the edge of the tower on side 2. It attaches behind the mansion edge of side 1 as shown. Next add the left and right ends. Fold the main part to be flat. Fold in the tabs on one end. The back tab goes behind the back side and gets adhered in place to the back of the mansion. I used score-tape here. The front tab is folded in behind the side and adhered in place . It should be behind the front wall and not visible from the front. If you do this while the village is folded flat, this piece will align properly. Repeat on the right end. Bottom view with all 4 pieces together. Add the additional details. The bats and the pumpkins get added to the locations you want. The haunted mansion looks great as is but you can keep going by adding spider webbing or fairy lights or LED tea lights. Your village is now complete. How many willl you make and who will you send them too? Remember, it folds flat for storage or mailing! 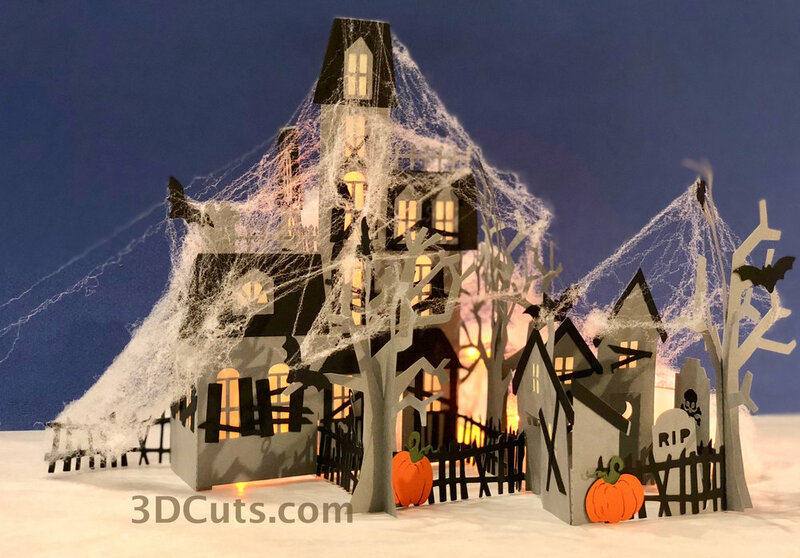 Take photos of your finished project and share them to Pinterest, Facebook groups, and email them to me at marji@3dcuts.com. I like to share the creative things people do with my files here on the website.